The most recent (July-August) MEI value shows a continued drop from earlier this year, reaching -1.81, and 2.35 standard deviations below April-May, both record-fast drops for this time of year. In fact, the three-month drop set a new all-time record for any time of year, beating a drop in 1998. The most recent MEI rank (2nd lowest) is clearly below the 10%-tile threshold for strong La Nina MEI rankings for this season. 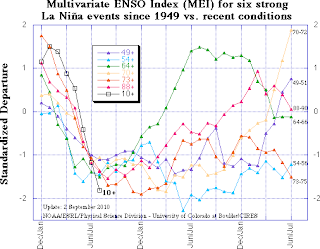 One has to go back to 1955 to find stronger La Nina conditions for this time of year in the MEI record, and back to September-October 1975 for lower MEI values at any time of year. We have one heck of big La Nina that has formed very quickly. We have not seen conditions like this in 55 years. La Nina brings warm water to the western Pacific. This will result in big storm after big storm hitting into China/Indonesia. So far there have been 11 typhoons to hit Asia this season. The most recent is Fanapi. It is about to make a mess of southern Taiwan. From there it is off to China. This powerful La Nina will continue for at least four more months. It is likely that it will end as quickly as it appeared. That transition will bring us violent storms. These in turn can send a whole lot of pulses, read systems, into the Bay, and result in strenghtening the NEM. And the rest of the World:Look out for an extra cold winter and some cold water splashed on the claim "2010 is the hottest year ever." Why is this La Nina cycle so strong? I have no clue. Nor do the people who study global weather. The strength of this ENSO cycle is no doubt related to that phenomenon. *And a Final word on the so called "Global Warming"
(For new readers, vagaries has always been against the concept of so called "Global Warming". See archives of vagaries for a series of blogs in 4 parts explaining the facts against it). This powerful La Nina will continue for at least four more months.